Home / Blog / What’s the Deal with White Chocolate? White chocolate is pretty much the underdog of dessert. Most people either love it or hate it. White chocolate is pretty much the underdog of dessert. Most people either love it or hate it. But beyond the argument of “That’s not real chocolate”, detractors of this tasty treat really don’t have much evidence to back up their claims. It is true that if white chocolate isn’t made properly, it can taste horrible. 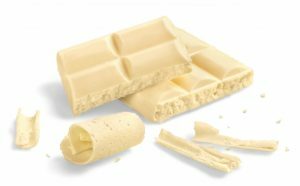 If purchased from a good, reputable chocolate maker, however, white chocolate can be just as yummy as any other chocolate. Come on in to Wockenfuss today and give white chocolate a chance! Yes, White Chocolate IS Real Chocolate! It’s pretty odd that so many people really believe that white chocolate isn’t actually chocolate. Up to 45% of its mass comes directly from the cacao pod. When dark chocolate is made, ingredients such as cocoa solids, sugar, emulsifiers, and flavorings are used. With white chocolate, chocolate makers simply trade the cocoa solids for milk solids. White chocolate is just as full of cocoa butter and all of that other delicious chocolatey goodness. The cocoa solids found in other types of chocolate are what contain the bitter, tannic, and berry flavors that make darker chocolates taste the way they do. This is what makes white chocolate taste so different, but by no means is it flavorless. Cocoa butter offers its own unique taste, and the chocolate maker’s choice of milk solids will also make a difference in how the white chocolate tastes. The mild flavor and creamy texture of white chocolate make it one of the most versatile ingredients in a dessert chef’s pantry. It can easily be used to highlight other, subtler flavors, giving dishes all-new dimensions of taste. White chocolate can also be employed in crème and icing recipes to give them a smooth, creamy texture. White chocolate covered pretzels – We start with crunchy pretzels and cover them in a layer of smooth white chocolate. It’s the perfect blend of sweet and salty – try some today! White chocolate bite-size truffles – First, we mix up a creamy chocolate ganache. Then, we cover it in a protective layer of white chocolate. They’re two chocolates for the price of one! This entry was posted on Friday, October 13th, 2017 at 2:48 pm. You can skip to the end and leave a response. Pinging is currently not allowed.